Yikes. I’m smack in the midst of my annual Christmas Conundrum. On the one hand I want to spread good cheer by lavishing gifts upon my horsey friends and acquaintances. But on the other hand, I’m on a strict budget. So strict, in fact, that my husband had to pay the feed bill last week. That’s going to cost me, literally and figuratively, at some point. Yet Christmas only comes once a year and I can’t help but get caught up in the gift-giving spirit. If you’re also trying to stay on a budget without grinching anyone, here are some of my ideas. I call it my Nifty Thrifty Gifty Guide to a Horsey Holiday. (How’s that for a mouthful?). 1. If you’re like me you’ve got a bunch of baskets stuck in a closet somewhere. It seems like they’re the go-to container when a box just won’t do. But let’s face it. When someone gives you a gift presented in a basket, you spill out the contents and then you’re left with… an earnest example of empty wicker. 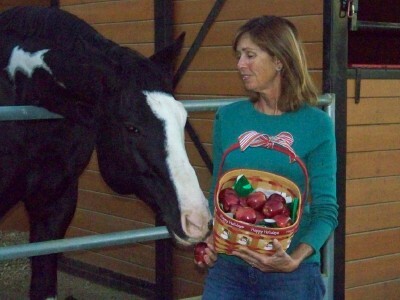 Well, for the horses on your list you can re-gift—I mean “recycle”—those baskets. Line the bottom with pretty wrapping paper, stick a bow on the handle and then fill them up with apples or carrots. I can get a 5-pound bag of little red apples at the grocery store for $2.99. It’s an inexpensive bushel of love. Danny is thrilled that Santa brought him an early gift of fresh apples. He doesn’t even care that this basket originally held scented bath soaps and a loofah. 2. Though traditionally meant for English riders, tack tags also work for western riders who have an arsenal of schooling tack. They’re little brass (or stainless steel) discs that dangle from the buckle of a bridle or martingale. They’re attached with an S-shaped hook and are about the size of a dime. You can order them from your local feed or tack store, but you can also find something similar at large pet stores. After all, they’re more or less like a circular dog tag. Want to do something a little different? 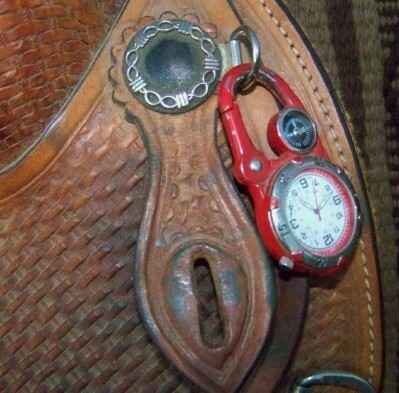 Instead of having the person’s first name engraved on the tag, personalize it with their horse’s nickname. It’s much cuter to look at a tag that says “Bandit” rather than one that says “Jennifer.” (My apologies to all those Jennifers out there). 3. Here’s another idea that adds a personalized touch. It was part of—gasp!—a gift basket given to my mom. It was a coffee mug that had a funny family photo imprinted onto the surface of the mug. You can get this transfer process done at mall kiosks, large drug stores and discount shops. I’d suggest taking a snapshot of your riding pal’s horse and having it applied to a mug. Then stuff a few packets of hot cocoa, some homemade glazed nuts or a handful of holiday candy into the mug. Over-wrap it with cellophane and add a snazzy bow and you’re good to go! 4. We wear boots. Our feet get dirty, smelly, and sweaty, and we have to wash our socks. A lot. Solution? Give the gift of a pair of boot socks. Enough said. 5. I’m notoriously out of touch with time, so one of my favorite gifts over the years was a clip-on watch. I liked it so much that I now own three of them. When I judge horse shows I clip one to the belt loop of my pants. But my main use is to clip one on my western saddle. That way not even I can loose track of time when I’m out on the trails. While you can purchase clip-on watches at any sporting goods store, they’re usually cheaper during sales at mid-range department stores. I think I got the last one, a flashy red one, for $12.99. This clip-on sports watch is one of the best horsey gifts I’ve ever received. It’s durable, practical and modestly priced. I no longer have any excuse for arriving someplace late, at least not on horseback. 7. The gift of great companionship is priceless, whether it comes in the form of a horse or a human. So if weather permits, corral your friends and organize a trail ride. Make it a rule that everyone has to wear holiday-themed clothing and also decorate their horse to some extent. Just keep safety in mind, lest some horse gets rambunctious when tinsel begins to tickle his hindquarters. Not much in the mood for the trails? Then schedule a time when you can all ride together in the arena. Bring along a portable CD player and play Christmas carols while you ride. Too chilly to ride? (I’m not giving up here). Hold a tack cleaning get-together with a festive touch. Bring enough hot chocolate and yummy treats for everyone. While you try to keep saddle soap separate from gingerbread, take turns reminiscing about your favorite horsey Christmas gift, your most memorable horse, or the wiliest pony you’ve ever known. See? There are possibilities for everyone on my Nifty Thrifty Gifty Guide! Now you’ll have to excuse me, because I have to rummage through the closet and drag out my stack of misbegotten baskets. The best gift I got last Christmas was a trail ride with my cousins. It didn’t cost them anything except their time and companionship. I grew up riding with them and have since moved away so when I went back for a visit last year- the ride was very special. I have a picture of the 3 of us right before we mounted up on the fridge so I’m reminded of that gift often! This year I won’t make it back home but I hope they’ll be up for another ride another year. Even with horses, the best gifts are free! I like the secret Santa idea. I wish some santa would come clean my corrals and leave me a note! Or groom the mud off my mare.